Looking for deals in Riga? Located close to UNESCO world heritage attractions - House of the Blackheads, Riga Dome Cathedral, and Latvian National Opera, Wellton Riverside SPA Hotel in Riga’s Old Town offers a bar, cigar room... Just Excellent! Location is perfect, walking distance to old city center, to Riga central market as well to public transport (tram and airport bus). Wellness area was amazing and big enough to us. Very good breakfast! Will definitely come back!!! 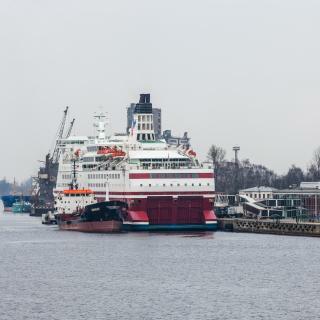 Built in 2016, Park Inn by Radisson Riga Valdemara invites its guests to stay on the western side of Daugava River with good connections to the Old Town, Riga International Airport and main sights. Very friendly staff. New hotel, perfectly maintained. You can find parking around. You can reach central district by riding few station or just walk 25 minutes around. The 4-star Avalon Hotel & Conferences is located in Riga’s Old Town, only 1640 feet from the Opera House and Freedom Monument. Great location in the old town. The bed was comfortable, the rooms modern and clean, the staff was really friendly, and the breakfast was delicious. Would recommend and stay there again. 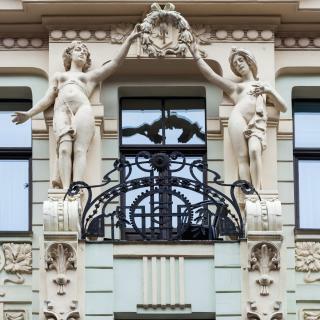 The Art-Nouveau-style, 4-star Neiburgs Hotel is located in the heart of Riga’s Old Town, overlooking the Dome Square. It offers luxurious, air-conditioned apartments with a kitchenette. I am originaly latvian and keep coming back with my husband to Riga every year. Located in Riga, 1804 feet from the Freedom Monument, the Radisson Blu Elizabete Hotel offers spacious, air-conditioned rooms with free Wi-Fi. It also has a sauna and fitness center. The breakfast was outstanding. The staff were very friendly. Located in the heart of Rīga, Ibis Riga Center is set across the street of Riga Central railway station and 1312 feet from the Old Town of Riga and Latvian National Opera. The bar was open at night, the bartender was very kind to make us some tea at 3a.m. Located in the Art Nouveau district and in the center of Rīga, within a 10-minute walk from the Old Town, Mosaic Hotel offers rooms with free WiFi. Perfect location, receptionist was exceptionally helpful. Dreamfill Apartments Riga is located in Riga, just 1804 feet from Galleria Riga Shopping Center and 1969 feet from Olympic Skonto Hall. Free WiFi is provided. The property is clean. Personnel is very friendly and always smiling. Very nicr location. Located on the peaceful island of Kipsala in the Daugava River, 3-stars Superior class Hotel Vantis is just a 5-minute drive from Riga Old town. It offers free Wi-Fi and free guarded parking. The property and the room itself very clean. Bella Riga Hotel, 3-star hotel in Rīga, features free WiFi access and free private parking. Pets are allowed upon request. Bella Riga Hotel offers rooms with private bathroom. Perfect value for money. Clean and comfort interior, good and spacious room. Located in the heart of Rīga and housed in a beautiful 1901 Art Nouveau building, Mercure Riga Center is 1312 feet from the Old Town and next to the Riga Train Station. Perfect location within walking distance to many of the sights. 4-star Astor Riga Hotel is located in the heart of the Old Town, with most of the Old Town sights located in an area up to 1640 feet from the hotel. The place was small and welcoming. Featuring a sauna and a hot tub, the 3-star Riverside Hotel is in Riga, a 15-minute walk from the Old Town. It has rooms with free Wi-Fi and bathroom floor heating. Very comfortable rooms and rich breakfast. The elegant Hotel Roma is located in the heart of Riga’s Old Town, 656 feet from the Freedom Monument. It features spacious rooms with a safe and a mini-bar. Located in the city center, you can walk everywhere. Room was very comfortable, big bathroom. Grand Palace Hotel - The Leading Hotels of the World is located in the heart of Riga’s Old Town, only 328 feet from Riga Castle. It features rooms with free WiFi, a mini-bar and flat-screen cable TV. The staff was very friendly, helpful, and knowledgeable. This Superior 4-star modern hotel Wellton Riga Hotel & SPA is located in the heart of Old Town and features a restaurant Tapas Tapas where guests are served Latvian and European cuisine. Location,rooms,staff almost everything..
Gallery Park Hotel & SPA is a boutique 5-star hotel located in the historic center of Riga next to the Old town and Art-Nouveau district, as well as international embassies. Good garage service under the hotel building. Music was played in garage when i parked my car. The 4-star Monika Centrum Hotels is set in the Neo-Gothic building from 1883 and located 1640 feet from the Old Town of Riga. It features air-conditioned rooms with free Wi-Fi and a mini-bar. The staff were very friendly although not very fast at checking us in. This new and unique hotel and entertainment center is located in the city center of Riga, only an 8-minute drive from the old town and the train station. Quite, clean , excellent service ! 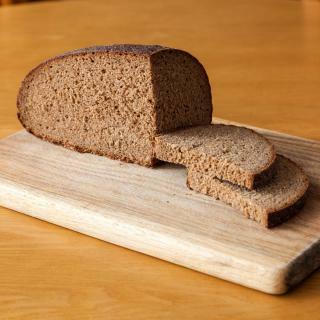 Which hotels in Riga offer an especially good breakfast? 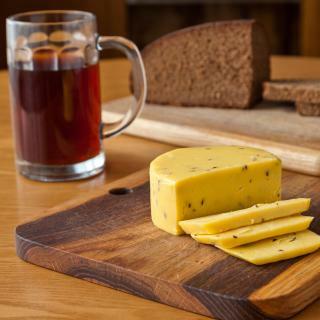 For hotels in Riga that serve highly-rated breakfasts, try Relais Le Chevalier, Grand Poet by Semarah, and Hotel Bergs. How much does it cost to stay in a hotel in Riga? On average, 3-star hotels in Riga cost $52 per night, and 4-star hotels in Riga are $86 per night. If you're looking for something really special, a 5-star hotel in Riga can be found for $184 per night, on average (based on Booking.com prices). How much is a hotel in Riga for tonight? On average, it costs $42 per night to book a 3-star hotel in Riga for tonight. You'll pay around $77 if you choose to stay in a 4-star hotel tonight, while a 5-star hotel in Riga will cost around $182, on average (based on Booking.com prices). Which hotels in Riga have nice views? Redstone Boutique Hotel, Hotel Vantis, and Neiburgs Hotel got great room view-related reviews from travelers in Riga. How much is a hotel in Riga for this weekend? The average price per night for a 3-star hotel in Riga this weekend is $89 or, for a 4-star hotel, $170. Looking for something even fancier? 5-star hotels in Riga for this weekend cost around $371 per night, on average (based on Booking.com prices). Which hotels in Riga are good for families? Many families visiting Riga loved staying at Dome Hotel - Relais & Châteaux, Grand Hotel Kempinski Riga, and Grand Poet by Semarah. Which hotels in Riga are good for couples? These hotels in Riga are highly rated by couples: Neiburgs Hotel, Grand Poet by Semarah, and Grand Hotel Kempinski Riga. Which neighborhood is the best one to stay at in Riga? Riga Old Town, City Center, and Agenskalns are popular with other travelers visiting Riga. Which hotels are the best ones to stay at in Riga? Grand Poet by Semarah, Wellton Riverside SPA Hotel, and Wellton Centrum Hotel & SPA are some of the popular hotels in Riga. 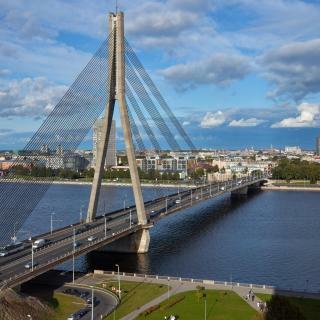 What are the best hotels in Riga near Riga Airport? Travelers who stayed in Riga near Riga Airport (RIX) have said good things about Sky High Hotel Airport, Airport Hotel Mara, and Spare Hotel. What are the best hotels in Riga near Three Brothers? Some of the best hotels in Riga near Three Brothers include Grand Hotel Kempinski Riga, Grand Poet by Semarah and Tree House. 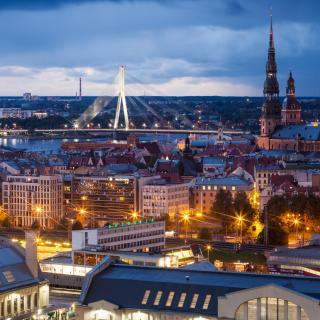 Right on the Gulf of Riga, at the mouth of the Daugava River, Riga is a major cultural city with stunning architecture, large parks and fascinating traditions. The Old Town in Riga is a UNESCO World Heritage Site, popular for its Art Nouveau and 19th-century wooden architecture. St. Peter’s Church is one of the oldest medieval Gothic churches in the Baltic states, featuring breathtaking views of the city. Enjoy a romantic walk through the historic cobbled streets, then head to the colorful Central Market where you can taste local specialties. Most of the local cuisine consists of pork, potatoes and sausage, while beer is the most popular alcoholic beverage. Each year the capital of Latvia hosts a variety of international exhibitions and science conferences, and Riga’s Creative Quarters house art and fashion shops that give you an insight into the spirit of local life. Explore everything this exciting city has to offer from your hotel, apartment or hostel booked through Booking.com. The city is served by Riga International Airport, the largest airport in the Baltic states. The interesting parts of Riga could be covered in a day, maybe two. It's a business city, and, outside of the Old Town core, not very compelling. But if malls full of women's dresses are your thing. This is the place for you. Riga is such a charming place. Riga is such a charming place. The streets and restaurants of old town are so cozy. People are welcoming and you have a lot to see and do, from parks to museums. The sunny weather helped a lot too. Loved it and will recommend to all my friends. Riga has the energy of a true post Soviet Eastern European city rising from the ashes and despair of Communism. It reminds me a bit of Warsaw Poland 10 years ago. It's brimming with energy. It's where things are happening in Latvia. It's where the young people want to be. There are bars, pubs, and cafes every few steps. The low cost of living means you have an eclectic mix of young students, Russians, Latvians, foreign students, artists, hipsters, and so on. There is a great entrepreneurial revival happening in Latvia and Riga especially and the low costs means a low barrier to entry to set up shop and try something new and interesting. It is the freedom to try and the freedom to fail. The youth of Latvia are embracing these entrepreneurial ideas with fervor. It is a wonderful place to be if you have a little money in your pocket, and a place where your fall has no bottom if you fail. Mixed in with this resurgent Baltic youth is homelessness, drug addicts, alcoholics, those who never adjusted to post-Communist society, and impoverished elderly begging. Visit and see for yourself before Latvia becomes relatively wealthy like Poland and things stabilize, or should I say, stagnate. Now is the time to be in Riga! 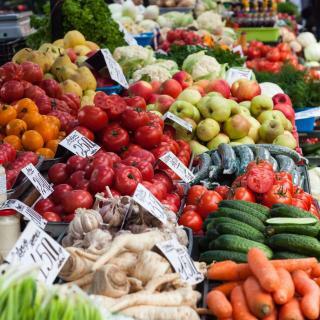 I would add that the food and service in most of the successful and popular restaurant is excellent and equal or better than what you will get in most Western European countries at a lower price. There is also a very lively bar and night life scene. Riga is an interesting place, with such a huge history that it was difficult to see it all in 4 days, but we tried! We were central, right by St Peter's Church, which made exploring very easy. The city is small, and so easy to wander around, with bars and restaurants galore. The architecture is spectacular, and the small, cobbled streets are a delight. It's definitely worth visiting the other side of the city, beyond the Latvia Freedom Monument to get a flavour of the Art Nouveau buildings that proliferate. it's a different atmosphere also, with residential areas giving a more complete picture of life in the city. We caught the train to Jurmula, which is the seaside resort for Riga, and is around 30 mins from the city. Buy tickets at the station, very easy. The journey takes you through some dramatically Soviet towns, which are in stark contrast to the picturesque city, but are worth seeing nonetheless. Jurmula is lovely, well worth the trip. Our favourite place to eat while we were there was the Folkklubs Ala Pagrabs - Peldu iela, which is very popular and rightly. very friendly with live music and great, reasonably priced food. Book if you can! Great city with amazing architecture. Great city with amazing architecture. There are thousands of historical buildings, especially in the city center area, that are dated to 1900s, 1800s, 1700s and even back to 1200s. Most of these buildings are well maintained. The vibe is good, people are friendly, prices are rather low. Plenty of museums to visit. We arrived earlier than expected to the hotel. Check in time is 15.00 but the room was ready at 13.00. We were upgraded to a junior suite which was of very good size. The lady who checked us in was very polite and helpful and spoke excellent English. An excellent breakfast. A good location for the train station and strolling in the old town of Riga. The property is traditionally Latvian situated right in the centre of Riga. It is walking distance to our favourite part, the old town of which there are so many shops/restaurants/cafes within just a 5 minute walk radius of the hotel. Having breakfast included every morning was also a lovely addition and helped a lot. Excellent value for money. Lots of character. Right in the centre of Riga. 5 min walk to train station, 2 min walk to beautiful Old Town. Two big shopping centres 2 min away. Number 22 bus (to airport) stops right opposite the hotel. Breakfast was very good. Beds comfortable. That was our second stay and we will stay again. Everything was perfect, a real 5 stars, very well deserved. Super Spa, super room, super breakfast, the hotel was very clean and confortable. There is also a little park in front of the hotel and with only 5 minute by foot you are in the old town. If I 'll come back to Riga I will chose it again. I LOVED this hostel! Solo female traveler from the US, I felt safe and it was in the perfect location for exploring old town. The reception staff was very sweet and helpful in suggesting things to do, places to eat, etc. If I ever return to Riga I'll definitely stay here again. Nice, new, clean hotel right in centre of Riga. Close to train and buss station and right next to Old Town. Room clean and comfortable, good choice of breakfast, friendly staff. Hotel organised taxi transfer from airport what was very convenient. Definitely recommend. I would recommend this hotel. Bed is large and comfortable. It’s located the center of Riga old town, but it’s quite at night. The reception is from 7-21 o’clock. Although we arrived a bit later after 21 o’clock, they still waited for us. Apartment in the old town, right to the main monuments. It’s a wide apartment, suitable for a family or a couple. It could be a good solution due the hotel price in Riga. Pay attention there is not lift. Great location very close to the attractions of the old town but in a quiet area so there isn’t a lot of noise at night. Rooms are large, clean and comfortable. Staff are friendly. It’s a nice hotel. Very good location. Zoo is close, as well as Riga MotorMuseum. Easy to get to old town by car. All the time was very quite. Underground parking is very convenient. Liked that it is almost in the very center of the old town. And it was easy to reach it from the airport. The bus stops in 4-5 minutes of walk. The hostel is simple, clean. Especially we were enjoyed with the perfect location- the center of Riga's old town, free live music! In the heart of Riga old town. Very quiet at night. Beautiful lobby. Historic buildings. Great breakfast. The hotel was 3-5 minutes walking distance to the old town of riga. With Bars & Restaurants. The place is neat. It is a mosern hostel in the old town of riga. Everything is accessible. Everything was clean and super tid, staff was welcoming and friendly, check in procedures wasn't complicated.